"Like arrows in the hands of a warrior are sons born in one's youth. Blessed is the man whose quiver is full of them." What, you didn't interpret that as "have 10 children?" If you've wondered about the rationale for Duggar-style family planning, look no further than the above-mentoned Psalm, 27 to be exact, which is the motivating factor behind the so-called "Quiverfull" movement. Birth control, obviously, doesn't fill a quiver, and so the approximately 10,000 families who participate in the movement take as many as children as God decides to give them. An NPR article quotes a number of families, all brimful with children, who employ an enviable amount of thrift and organization to keep their jumbo-sized broods in line. To a one, they're happy in their choices, and feel their large families are an unmitigated blessing. What's troubling is not, obviously, the idea of a large and loving family, but rather, some of the downright messianic rhetoric of the movement's leaders. Says Nancy Campbell, author of Be Fruitful and Multiply,"The womb is such a powerful weapon; it's a weapon against the enemy." Campbell regrets having had only six children, saying, "I think, help! Imagine if we had had more of these children!...My greatest impact is through my children. The more children I have, the more ability I have to impact the world for God...We look across the Islamic world and we see that they are outnumbering us in their family size, and they are in many places and many countries taking over those nations, without a jihad, just by multiplication,"
On the one hand, it seems alarmist to worry about an army of Quiverfulls overtaking the government. It is, after all, still a relatively modest movement. And however stringent their beliefs system, does it necessarily follow that every one of these offspring will be a sinister force for evil? It's easy to see groups of people as faceless, terrifying hordes, and this seems as dangerous as Campbell's generalizations about "jihad." Then too, her fears are based on a Quiverfull "best case scenario," and having this many children takes money and organization; it's possible that's not a challenge even the faithful will want to overtake - and this presupposes serious universal fertility. 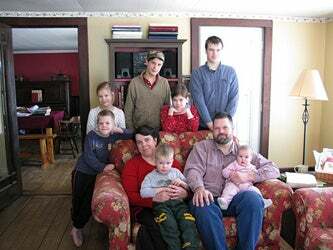 That said, Joyce's point is well-taken: in our admiration for the organization and quaintness of families like the Duggars, it's easy to forget that there's a frankly fundamentalist basis to the fecundity that's part and parcel of a larger, frequently problematic belief system. We might tsk tsk at the notion of a sinister, faceless Army of God in a distant future- but for now, are we willing to give up John and Kate Plus 8?